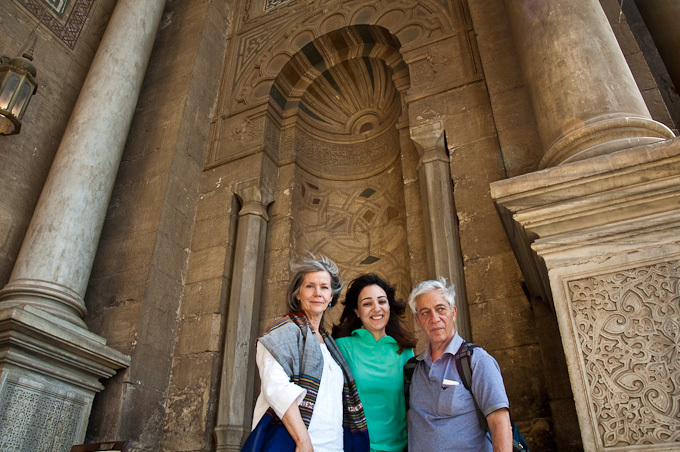 Today, found me back at the Citadel visiting the Muhammed Ali Mosque with Rana and her friend Shawza (a young prosecutor). 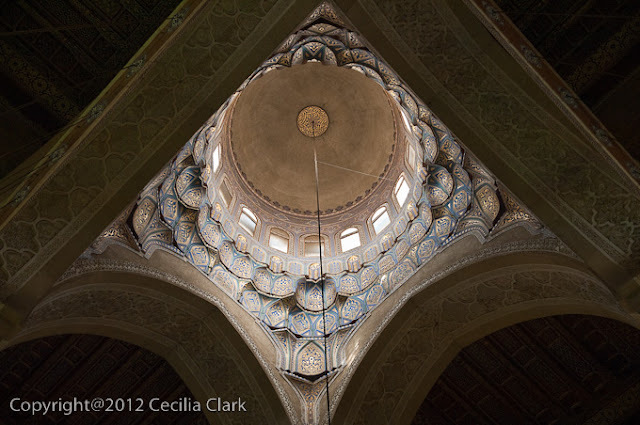 Rana invited us to join a tour of four mosques organized through Facebook. A huge group of Egyptians assembled for this tour. It's rare to see Egyptians touring their monuments. 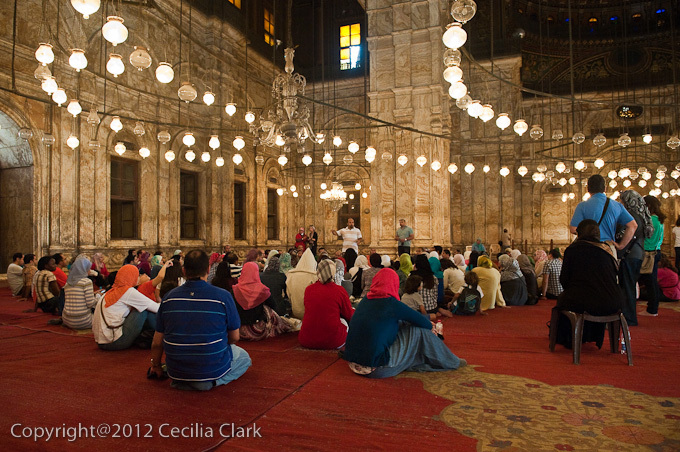 At each mosque, there was an in depth, scholarly lecture about Egypt's history and the architecture. 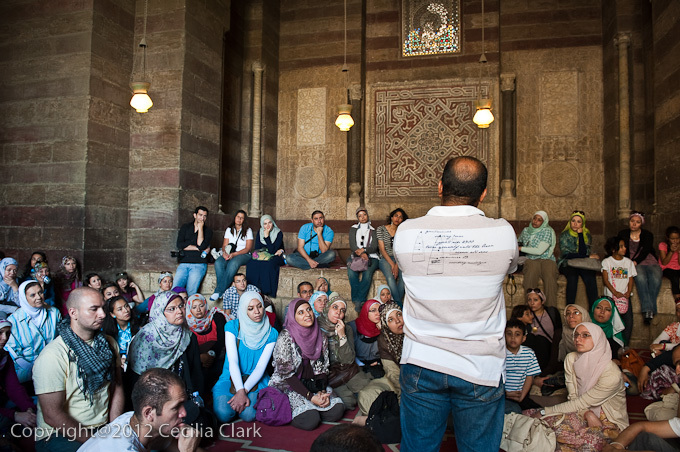 The lecture was in Arabic, but there was one young woman, Ayat, who translated for me, a Brit named Alex, and Dan when he joined us. 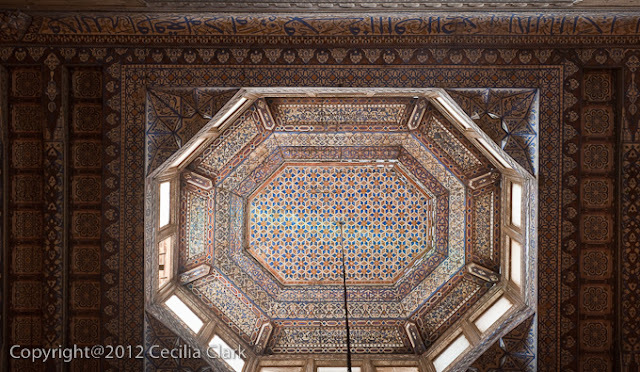 I learned that the crescent and star, both 6 and 8 points, were merely geometric shapes when they were first employed in Islamic architecture. 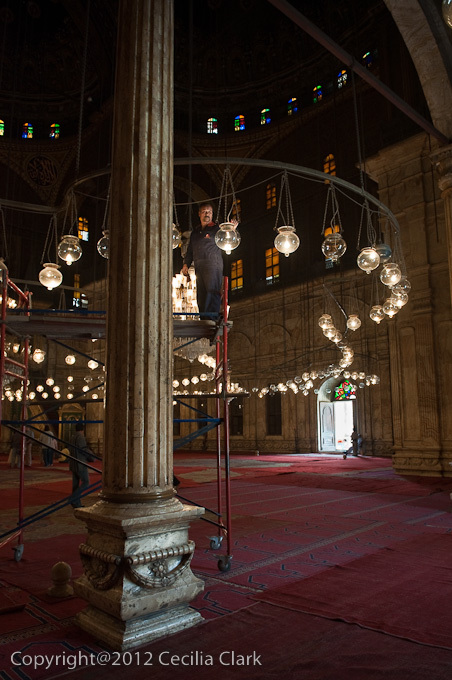 During the lecture, a maintenance man began cleaning the glass globes on the hundreds of lights in the Muhammed Ali Mosque. The Mosque of al-Nasir Muhammad, Mamluk architecture, near the Muhammed Ali Mosque in the Citadel was our second stop on the tour. 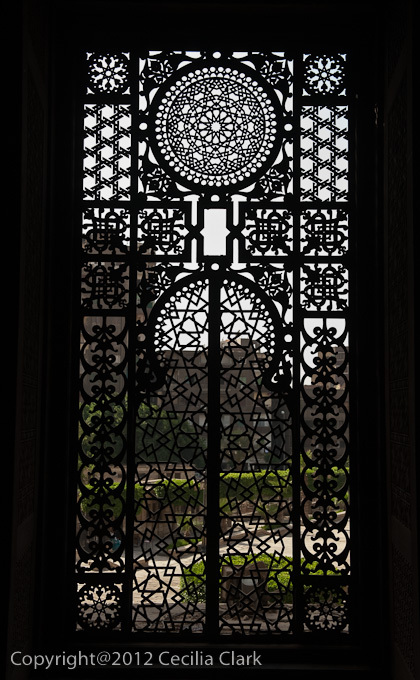 The lecturer pointed out that the decoration around the top walls mirrors the void space and the void space connects the sky to the mosque kind of like a puzzle piece. The multi-leveled arches were built to vent heat from the inside spaces. Next we took the Saladin Inside Passageway down the hill to the Sultan Hassan Mosque for another tour and lecture. 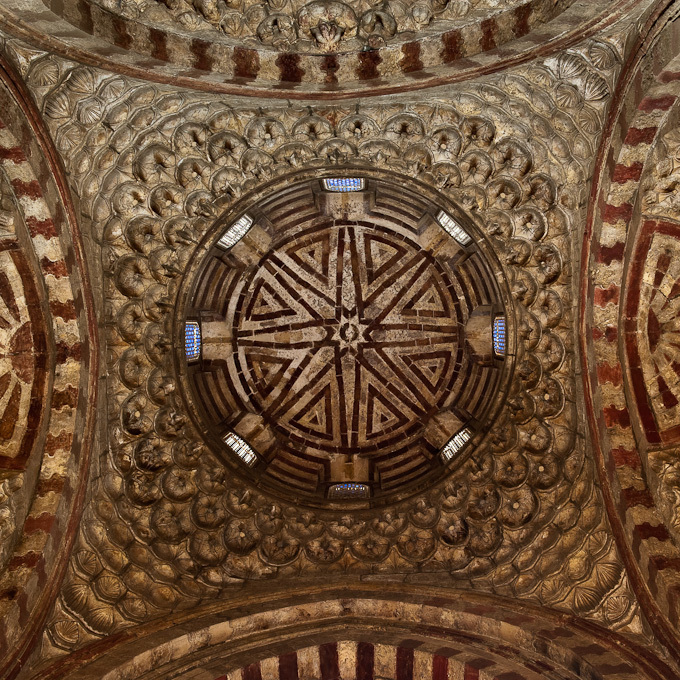 The dome of the entryway to Sultan Hassan Mosque. 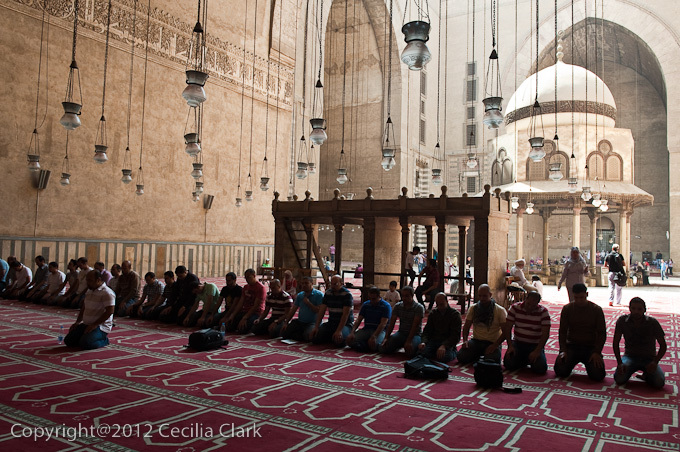 The call to prayer inside the Sultan Hassan Mosque with the open courtyard and fountain in the background. 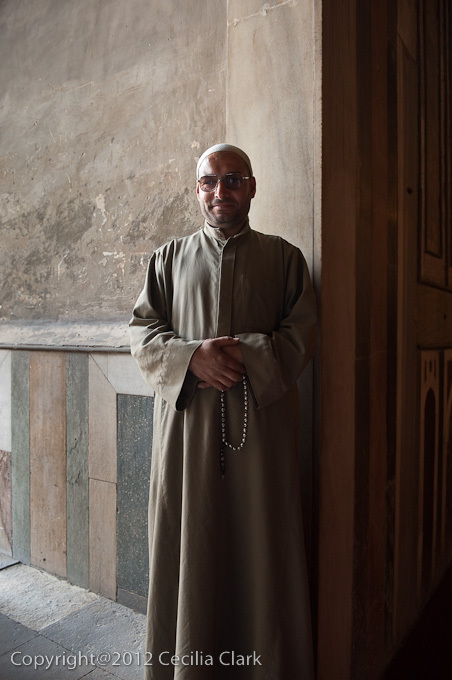 This man sang a shortened call to prayer inside the tomb room of the Sultan Hassan Mosque. He also sang the Koranic inscriptions surrounding the ceiling of this room. He had a beautiful voice. We lingered in the space for quite awhile. It is another lovely serene space. 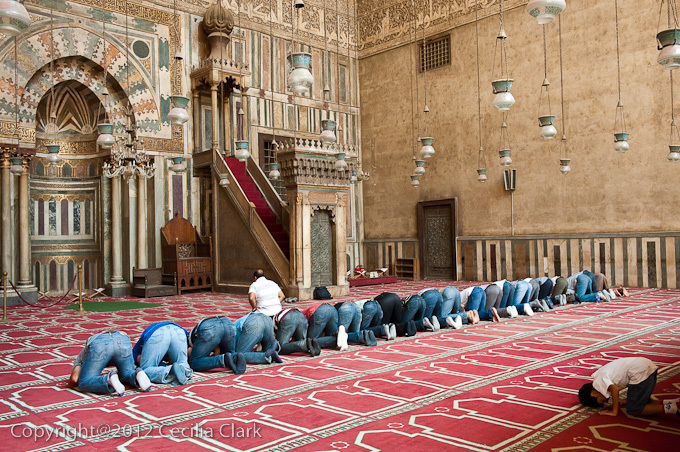 It was a mosque and a school of the four philosophies of Islam. 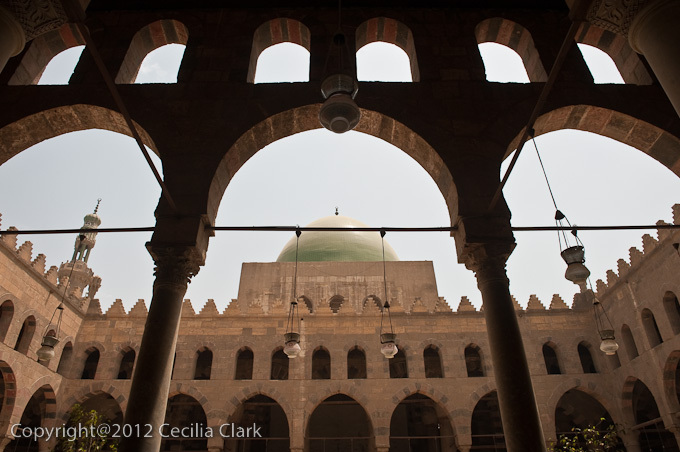 Sultan Hassan had this mosque/madrassa built during a time of famine. The structure is immense and it was built that way to make people feel insignificant in it's presence. Sultan Hassan planned on having his tomb inside the tomb room, but when the third minaret was built it collapsed on an orphanage killing several children. The Sultan wasn't able to calm his subjects (with the famine and the deaths and the hugely extravagant structure), and he was killed by them about 30 days later. The whereabouts of his body is still unknown. Our last stop was the Mosque of Al Rifai right next door to the Sultan Hassan Mosque. 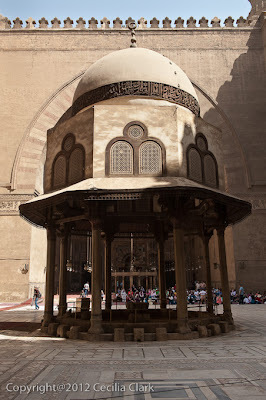 This is the day that Sufi Sultan Al Rifai was born and a big celebration of his birthday was beginning. There was lots of chanting and wailing at his tomb. The surrounding wooden lattice screen smells of fragrances because his followers rub scented oils into the wood. 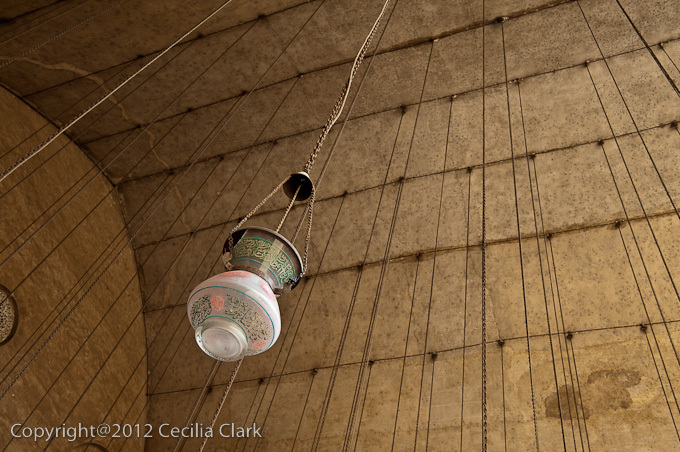 There are several tombs inside this structure. King Farouk and the Shah of Iran are both buried here. Back outside on the street, many of the pilgrims were waiting in tents for the evening celebration of Sufi Al Rifai's birthday to begin. There was even a small children's carnival being assembled. 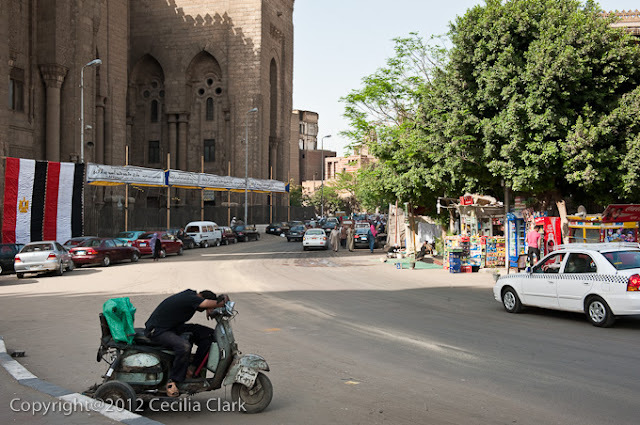 After the tour, we walked back toward the Citadel and met Gamal at his shop. We were joined by Zizi and their other son, Mohanad, who brought Egyptian pizza to share with us for dinner. Dan helped Mohanad practice English by drilling him in his normal prosecutorial style. Gamal showed us some of his new creations. He draws the scene and someone who works for him does the actual applique and stitching. 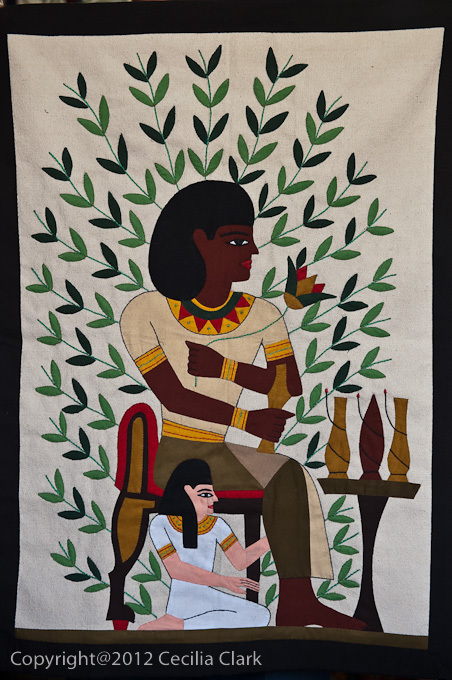 Many of his best pieces are sold in a shop in Coptic Cairo. With tourism dollars limited, his family has had to be innovative in finding work. Zizi and Basel are washing towels for a gym. Every day Basel picks up a load of dirty towels and delivers his load of freshly laundered towels. This is the reason for the car. The towels are washed in a machine in their home and hung out to dry on their balcony. Once dry, the towels are neatly folded and placed in a plastic wrapper. While this would not have been work they would have sought pre-revolution, they are not too proud to do a job that brings in badly needed income. We said goodbye again to our friends, and went back to the hotel to pack.